In an unnamed South American country, a birthday party is being held for a Japanese businessman named Katsumi Hosokawa. Guests from different countries have gathered at the home of Vice President Ruben Iglesias to be serenaded by opera’s most famous and loved soprano, Roxane Coss. The evening is perfect until a group of terrorists break into the vice presidential home and take the party guests hostage. But over the course of several months, unlikely friendships and relationships form as hostages and terrorists learn to live together in an unexpected, almost idyllic, mini society. This was one of those books that seemed to pop up everywhere that I just never got around to reading. I had read good things about it, but I’m always a bit skeptical of books with too much praise, simply because they hardly ever live up to the expectations I have for them. 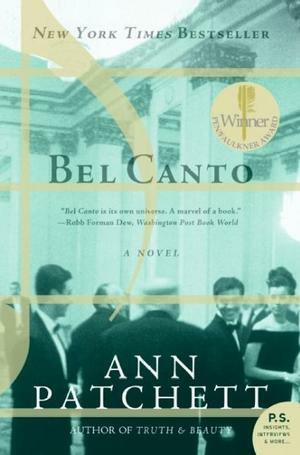 Bel Canto was one of the few books that I’ve read so far that actually deserved its acclaim. It is beautifully written, despite its simultaneously illogical and overdone plot. Patchett’s language is wonderful, even lyrical in places. And even though you know how the story is going to end, that knowledge does nothing to soften the punch to the gut at the novel’s climax. Despite the seemingly clear separation of good vs. bad, hostage vs. terrorist, the line begins to blur as the situation unfolds over weeks and months. Patchett’s ability to to make the reader sympathize with the terrorists is what makes the end of the novel so heart-wrenching. Yes, these are the bad guys, but that doesn’t make their fate any less devastating. It is unfortunate, however, that even though the denouement happens after almost five months, it is almost too abrupt. It didn’t feel earned, as if Patchett thought that there wasn’t any point in drawing out the inevitable. But with so little of the novel dedicated to the outside world, other than a member of the Red Cross who is the only person the terrorists will let in and out of the house, there is no buildup to the last pages of the last chapter. If it weren’t for that and the epilogue, this would have been the perfect novel. That being said, there is really something beautiful about this book. The relationships that form, as unlikely as they are, feel genuine, and you want them to work. You want to believe that there will be a happy ending for all involved, as improbable as that is. And when it becomes obvious that the happy ending isn’t going to happen, it’s almost heartbreaking. What I particularly liked about Bel Canto, especially after the travesty that was Testimony, was how deftly Patchett handled telling the story from many different points of view. Telling the story in the third person present was a smart choice, and I appreciate that decision. Similarly, the fact that Patchett chose not to name the country reminded me of The House of the Spirits, as Isabel Allende also never names the country where the novel is set. A small, inconsequential comparison to be sure, but one that stuck out to me immediately. Overall, Bel Canto is one of the best books I have read in a long time, and one that may easily earn a place among my favorite books. Tagged anita shreve, ann patchett, bel canto, isabel allende, testimony, the house of the spirits.